Let me say up front: I love Christmas. It’s my favorite holiday, my favorite time of year even, which considering my idea of a perfect life involves a beach and constant 70-80 degree weather with not a snowflake in the sky, is a pretty big deal. It means it makes me THAT happy. I like most Christmas music, I like the trees and decorations and all that jazz. 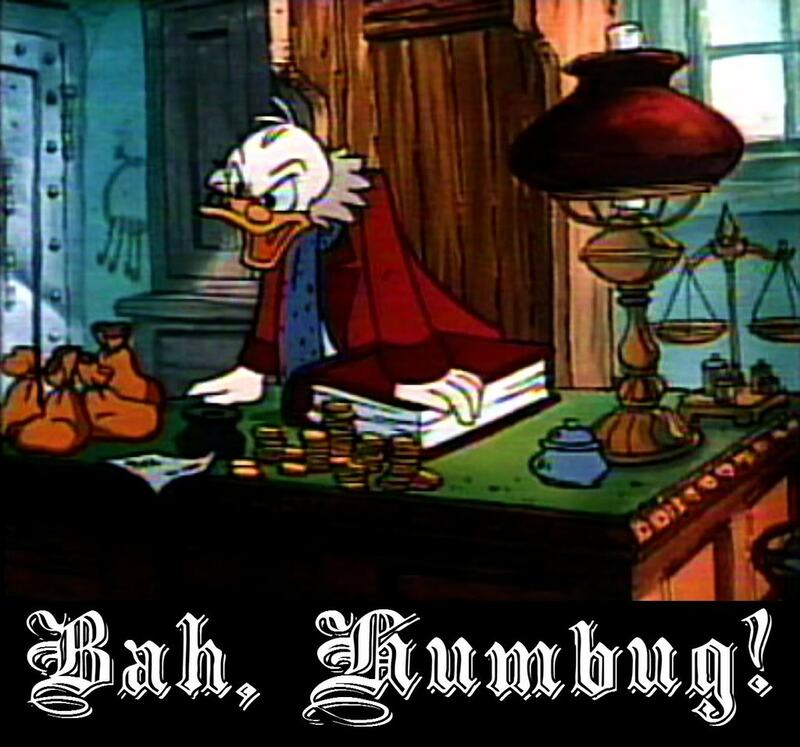 But I find when it comes to talking about Christmas movies, I feel more like Scrooge. Side note before I continue: To be fair, there are also a lot of classic Christmas movies I still have yet to see, or have not seen in a long time, and who knows, maybe I’d like them! If a movie isn’t mentioned, it probably falls into that category. That’s right folks, my favorite Christmas movies involve obnoxious kids going to the North Pole, obnoxious kids bossing around poor Charlie Brown, a sequel with big plot holes, and a classic that I generally dislike but I apparently like when done with puppets. And I like all these movies MUCH MORE than It’s A Wonderful Life. I’m not sure what this says about me… I’m not sure if I want to know. Or maybe it just means I want to keep my Christmas light-hearted. I’ll go with that… I mean, I don’t like all the drama in Holiday Inn. You saw my aforementioned problems with ol’ George. The Grinch makes me sad, and I just have a hard time believing Scrooge would change so drastically so quickly just because of the ghosts, not to mention that the past and future ghosts are WAY CREEPY. Just give me some music and good times. Now, non-Christmas movies where Christmas is part of the movie and/or plays a large role is a whole other story. Maybe I’ll blog about those before the month is up. What are your favorite Christmas movies? 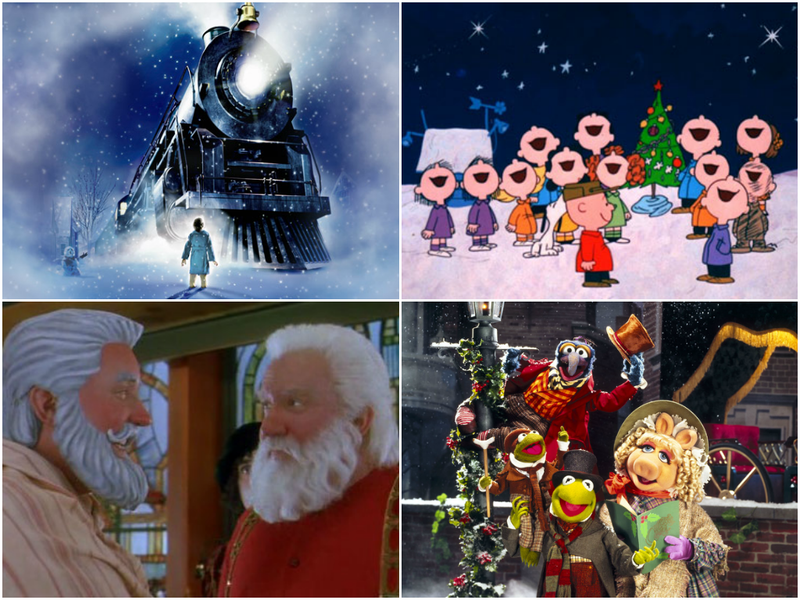 Are you a lover of all the classics and are totally offended by my Christmas movie preferences? Or are you a fan of more unconventional choices? This entry was posted in Movies and tagged Christmas, movies. Bookmark the permalink. Yay another one! My husband really likes the Patrick Stewart one so I’ll watch it, but let’s just say that outside of Stewart I can’t think of anything nice to say about it. So I totally thought I was the only one who thought The Grinch was sad. I told my students that the other day, and they all thought I was crazy, but I just feel bad for him because he is so lonely! I LOVE LOVE Christmas – the decorations…the lights…the music…but I can take or leave Christmas movies (and even Christmas themed books) – too fluffy. I agree! Glad to know I am not alone! I haven’t seen that one yet. I love it. It’s from the writer and director of Notting Hill and About Time. I don’t know why, but I really don’t enjoy Christmas-themed (or any-holiday-themed) stories of any kind. TV episodes, movies, books, whatever. Maybe they feel too… seasonal. Or maybe it’s because they so often have these *themes* and *morals/lessons* to them that don’t always feel genuine, or just feel trite. Or maybe I’ma Scrooge. I dunno. I’m generally not a fan of forced, trite messages either. And I get the thing about something too seasonal as well. I love that you made a post all about Christmas movies since I was asking around on Twitter to make a list of my own. 🙂 I have my handful of favorites, but I just *know* there have to be other great ones out there I’ve been missing for years. Hah, I agree with your dislikes! Some of them I haven’t seen but the rest I don’t even care to. I like the slightly more current fun movies involving Christmastime. I totally love A Christmas Story (I thought everyone else hated it! ), Elf, and Home Alone. I don’t care much for The Santa Clause but that’s a Tim Allen thing. I don’t think I’ve seen White Christmas or The Holiday yet. And I don’t think I’ve seen any of your annual viewings! Gosh I’m behind on movies. I’m gonna go with keeping your Christmas light-hearted. I mean, you can’t go wrong with the Muppets. Have you ever watched Scrooged with Bill Murray and Carol Kane and a bunch of other people? It’s a sort of weird mix between serious, sarcastic, and cooky but I love it. Carol Kane especially is hilarious, and I’m definitely due for a rewatching of that. I haven’t seen Scrooged yet, so hopefully I’ll get around to it sometime! It’s hard to see some of these movies if they don’t have a marathon of it on TV! I can’t believe you haven’t seen A Charlie Brown Christmas! But I’m a big Peanuts fan. I’m not a big fan of Christmas movies, either, and I’m glad to see I’m not alone. I’m even struggling to think of ones I’ve seen. I know I’ve seen the Santa Claus movies and enjoyed them for what they were but not enough to watch them again, and I like It’s a Wonderful Life well enough but don’t go out of my way to watch it. But I recently caught a free outdoor screening of the 1947 version of Miracle on 34th Street, which I hadn’t seen in years, and I think it might be a new favorite Christmas movie of mine. Also, I’m curious to hear which “non-Christmas” movies involving Christmas you like; I think I often enjoy those more. I didn’t include Miracle on 34th Street because it’s been so crazy long since I’ve seen it (the 47 version and the one from the 90’s) but I think I’m really do for a re-watch, because I think I liked it quite a bit while I was younger. And yes, I think most everyone will agree that non-Christmas Christmas movies are better! I’ll plan to do a post on it. Home Alone is definitely fun, I’ve just never really gone out of my way to watch it from year to year. Hope you’re able to find some other Christmas movies you enjoy, and I’m glad to know I am not alone with It’s a Wonderful Life! Aidan and I do a 1980 Narnia movie marathon each year! I can’t remember if I’ve seen that version of it or not… Is that the animated one or a different one? I didn’t really think of it as a Christmas movie but I guess I can see where you could consider it as such! Even though I kind of like A Christmas Story, I definitely don’t love it nor watch it frequently. Actually, I think I only catch bits and pieces of it every year and am not sure if I have ever seen it all in one sitting. Looking forward to seeing the list you have for me! I like A Christmas Story.. lol I can’t really think of many Christmas movies, does Rudolph count? I do like the Grinch, but only because I was in a play for it in high school, plus it does have a happy ending. I’ve watched the Mickey Mouse special that has the Scrooge McDuck story waaaay too many times..lol. I do like Christmas movies, though I haven’t seen many of the “new” ones. Rudolph does count! It’s been ages since I’ve seen it so I didn’t want to categorize my feelings for it. It’s also been ages since I’ve seen the Micky Mouse Christmas Carol! I’d probably like it more than some of the others I’ve seen. I wish I could see it less 😉 Seems like it’s on every day when my daughter is watching tv..lol Every day!